I went home craving for a cake. 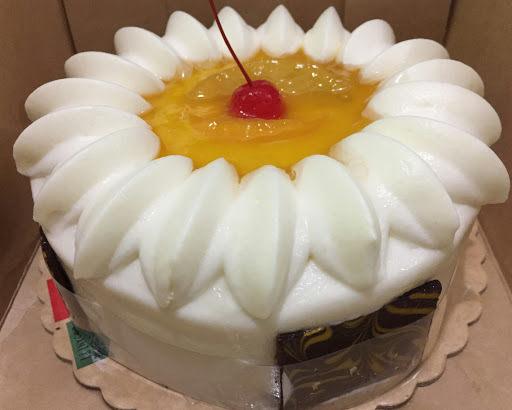 Not just a cake but something Mango inspired - yes, a Mango flavored one. Oh, I love Mango on a cake - Mango Bravo (Contis), Mango Bene (Mary Grace), even on Grahams (lol). It's been a while since the last time I have eaten a cake. That was a year ago. Yes, 2016 and we are now like 2017. Lol, the last I had a mouthful of cake was in December. I'm coming from work. Thirty five minutes past nine when I left the office. Saturday and a gloomy morning. The chill - only gave me more reason to be sleepy while on a commuter bus not to mention I'm a bit starving. I only had cookies and cups of coffee all through the night. Before heading home I made my way to the nearest Red Ribbon. On weekends, I usually visit their store to buy some sweets (Pulvoron, Macapuno, Tarts or cakes). When I was checking the racks I noticed a new flavored item is on display. I should know, I told you I am always visiting them on weekends, lol. It excites me because there's a Mango on the display name. Lo and behold. It reads: Peach Mango Symphony. I motioned the Cashier to give me one order for a junior size. It will be enough for me until tomorrow. It's a Vanilla cake with Mango mousse filling and topped with fresh mangoes and peaches, wrapped around with a chocolate bars and hints of cheese - making it sweet and salty feel. At 350php for a Junior and 550php for the regular size. It's better value compare to Mary Grace. But hell, in the end it will be judged according to your taste buds. Lol.